I haven't written anything in a while, I hadn't forgotten about the blog, just been bust with work and real life, etc. It's been just short of 2 months since my last session. I'm seeing an increasing amount of fading but nothing really amazing. The last time I waited this long for another session I was surprised how much it had faded, I'm hopeful of seeing a big difference by next month. The above picture is awful, it looked better on my phone. I didn't realise the tattoo was shaded, makes it harder to see detail. The fading is going quite well, the legs are becoming more see through, the hat has very little dark ink left. If I look at a photo from 9 months ago, there's a big difference. It's still a very slow process though. In January it will be one year since I started this journey. I had assumed I would have no tattoo at this stage. How wrong I was. I think I need to make some montages of the fading process, it will give me motivation. I have paid for another 4 sessions. I think I'll need more, but that could be pessimism. I'll know more after the next one, when I'm half way. I've now had 4 q-switched and 2 picosure sessions. My usual way to measure the fading is a photo from the night before the next session, I see that as the maximum fading before the laser comes back. 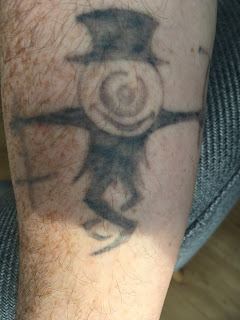 I've seen photos online where a black tattoo is totally gone after that amount of sessions. I think it's safe to say those are fake photos. It's unlikely I'll post again before new year. Next post will be one year since I started this, it will be interesting to see how things look. I'd like to do a side by side comparison, but like an idiot, did not take a picture. Still chin up, keep going. It's fading, it will vanish, it just takes a lot of patience.